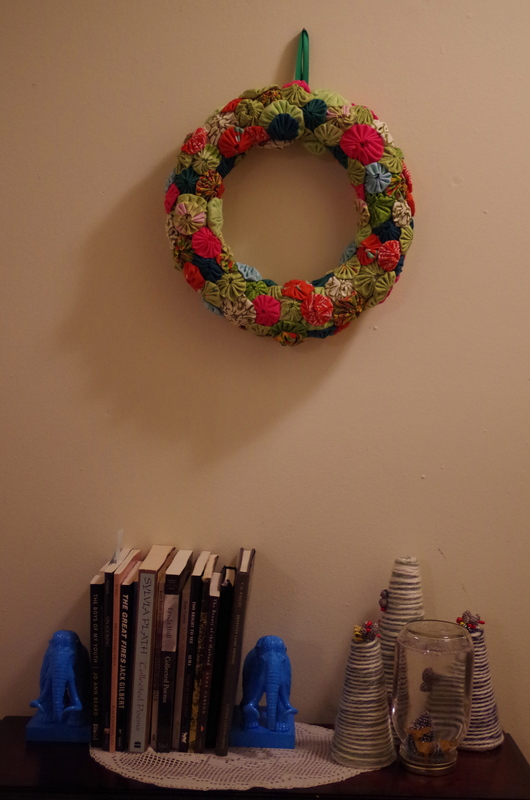 If there is one thing I cannot deny about myself, besides the fact that my hair is unmanageable and that I miss Tyra Banks having a talk show so we can all talk about how often she does that weird baby impression, it’s this: I love a craft project. I always have. Whether it was making beads from the pages of my mom’s old Victoria magazines to making little drummer boy ornaments from clothespins to pasting giant picture of giant frogs on the inside of my Trapper Keeper, I grew up crafting, and I’ve never stopped. 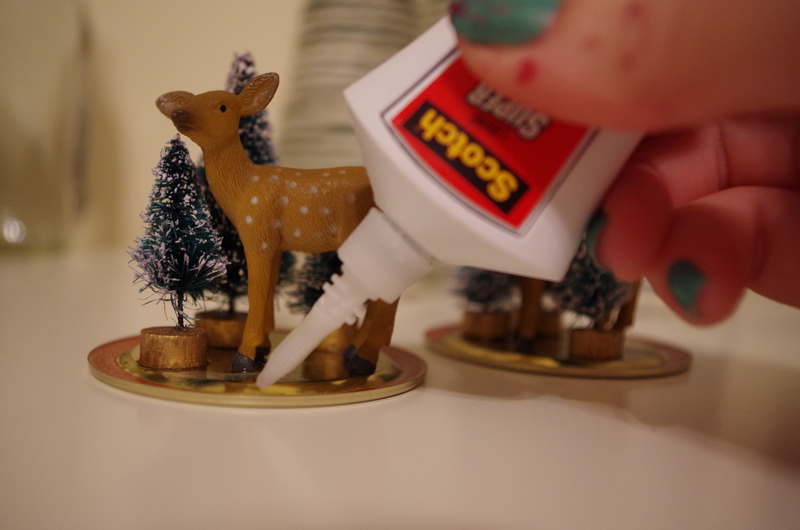 Though I hate Christmas, I have to admit that I do love that it gives me an excuse to pull out my hot glue gun and power drill and my extensive collection of glitters. 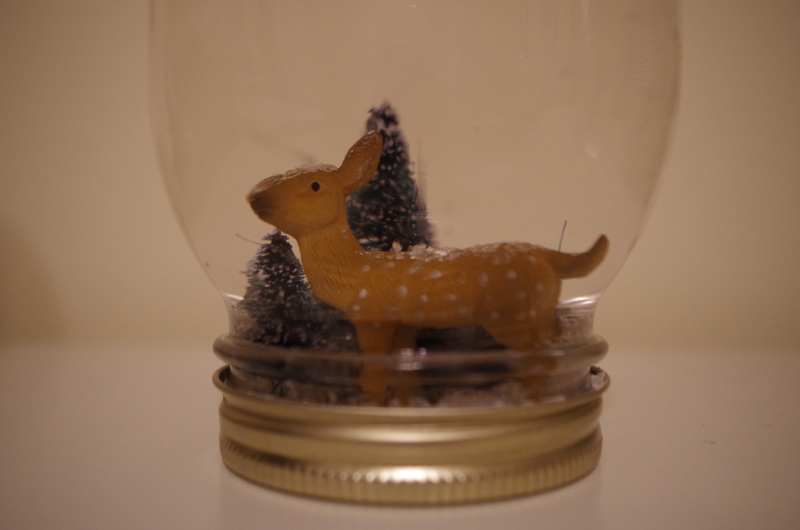 People have asked me to post a tutorial for one of my favorite Christmas crafts, the Mason jar snow globe, and in the spirit of holiday crafting and peer pressure, I give you just that. First, you’ll need to gather supplies. It will probably take you four trips to Hobby Lobby to gather all of said supplies because you keep forgetting what you need once you get in the store because there’s so much glitter there that it’s mind-blowing, and you also keep forgetting to make a list of what you need before you go to the store and see the mind-blowing array of glitters. Said supplies include: Mason jars, glycerin (which is completely impossible to find, so it’ll take you about a week of going to every drug store possible looking for it until you find it in the pharmacy across the freaking street from where you live, for Chrissakes, next to the hand lotion and Tincture of Merthiolate because apparently that makes sense), glitter, and festive stuff to go inside the Mason jars. The most important supplies, really, are the festive things that go inside the snow globe, because that’s what makes the snow globe festive and festivity? It’s important. 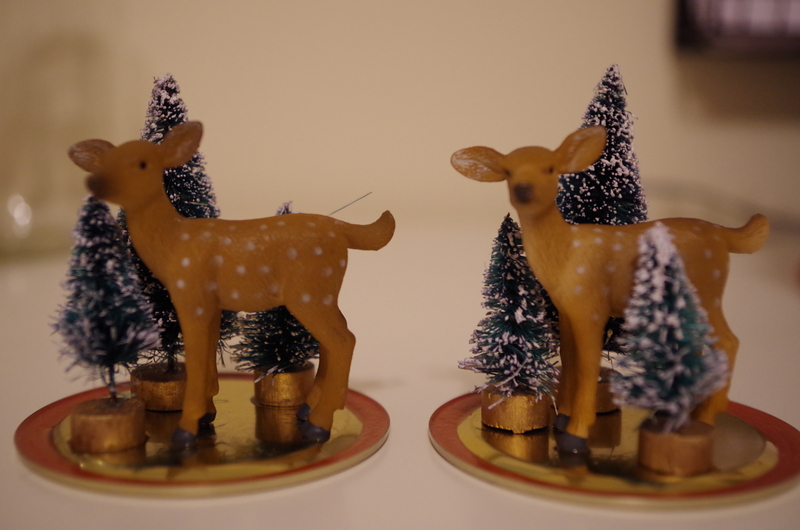 Here, I’ve gathered a plastic deer (because it was the cheapest little plastic figurine at Hobby Lobby that made any sense in a snow globe) and a bunch of little trees which are apparently called “bottle-brush trees.” That’s your craft fact for the day. You’re welcome. I read somewhere on the Internets that these can discolor the snow globe water, so I sprayed them with acrylic top-coat sealer. I’m not sure if that’s actually going to be effective, but it made me feel useful and pro-active and really, let’s be honest, it’s the holidays, and anything that makes you feel useful and pro-active is important. Arrange your festive stuff on the Mason jar’s lid. This is important so that you can make sure your festive stuff will actually fit inside of the Mason jar. It’s also important to make sure your festive stuff is festive enough. 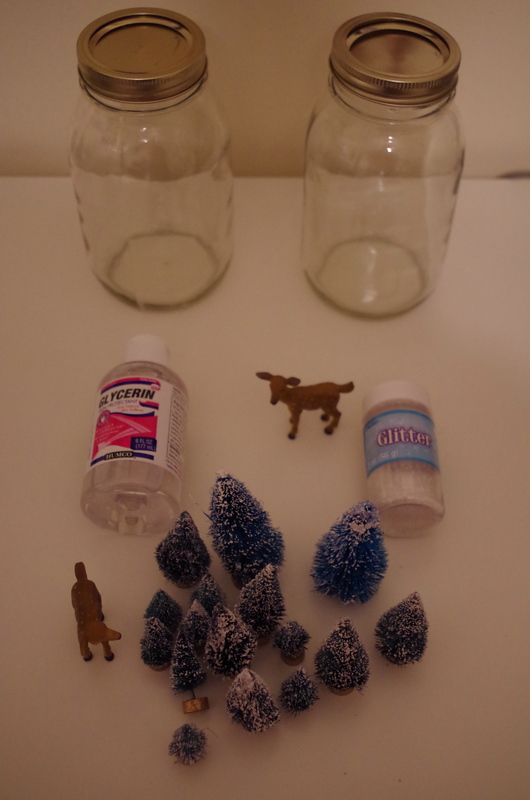 Here, I’ve created a scene in which a deer is frolicking in a bottle-brush tree forest. Frolicking? Definitely festive. Other suggestions for festive snow globe items include: snowmen, non-terrifying Santa Claus figurines (if you can find one), tiny recreations of Dickensian town squares, velociraptors covered in Christmas lights, velociraptors covered in Christmas lights attacking tiny recreations of Dickensian town squares, and tiny replicas of your enemies wearing only their undergarments so that they’ll be forever trapped in a freezing, watery, festive globe of terror. 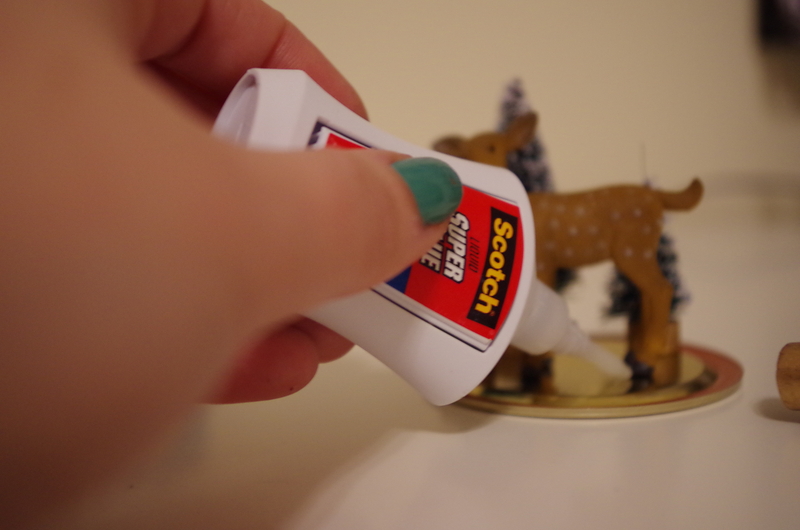 Now that you’ve created your festive scene and made sure that the Mason jar can handle all that festivity, glue the figurines to the jar lid using the superglue you accidentally left out of the photograph you took of necessary supplies. At this point, you’re totally impatient and really want to get this snow globe assembled. Tell your horses to hold their festive selves — you are about to put these things in water and if you don’t let the glue dry, it’s going to be a bad scene. Let the jar lids dry overnight. You can take this time to make other holiday crafts, like yarn-covered-styrofoam-form-Christmas trees or voodoo dolls of all of the relatives who will soon ask you embarrassing and relentless questions about why you’re not married and have so many cats. 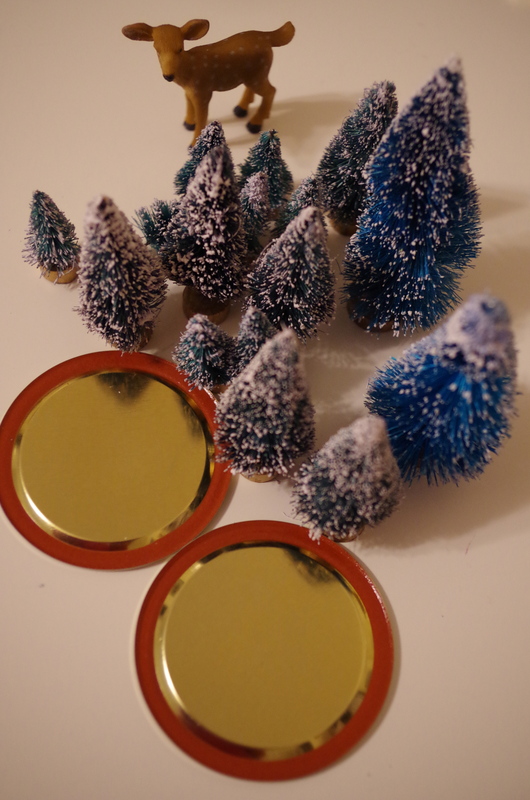 Once you give the figurines time to dry, it’s time to take another look at the directions for making a snow globe and notice that they call for distilled or boiled water. Realize that you are too cheap to buy water because it is water, and you’re also too lazy to change out of your owl pajamas and Muk Luks to go to a store to purchase said water. Boil the water instead. Just don’t watch it. 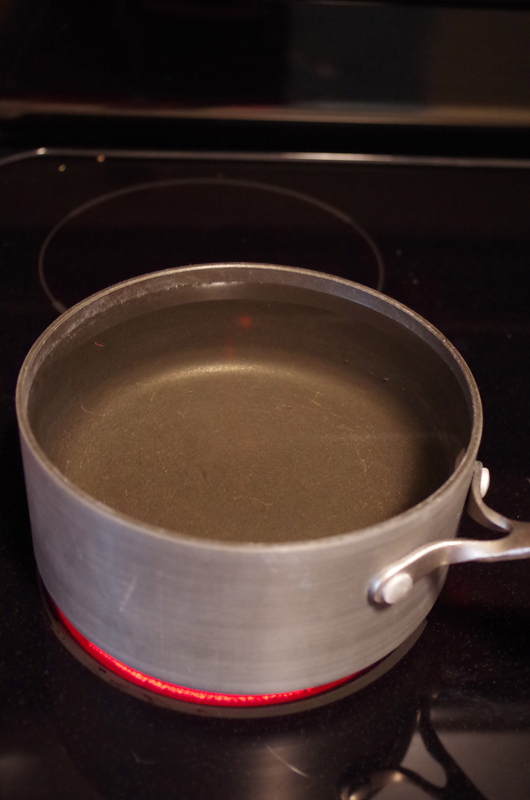 See how this water isn’t boiling? That’s because I’m watching it. So don’t. 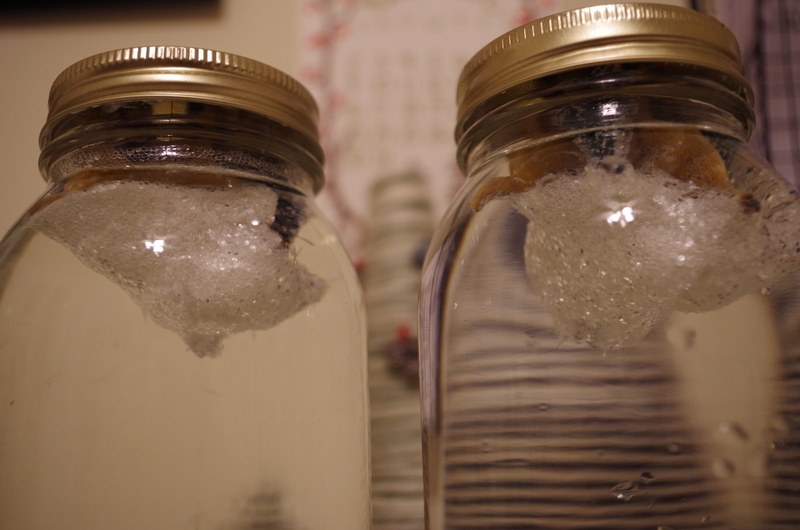 Once the water has boiled and then cooled back down to room temperature, you’re back in snow globe business. Pour the water into your finest glass pitcher because this sh*t is going on the Internet and you don’t want people to see how you live. 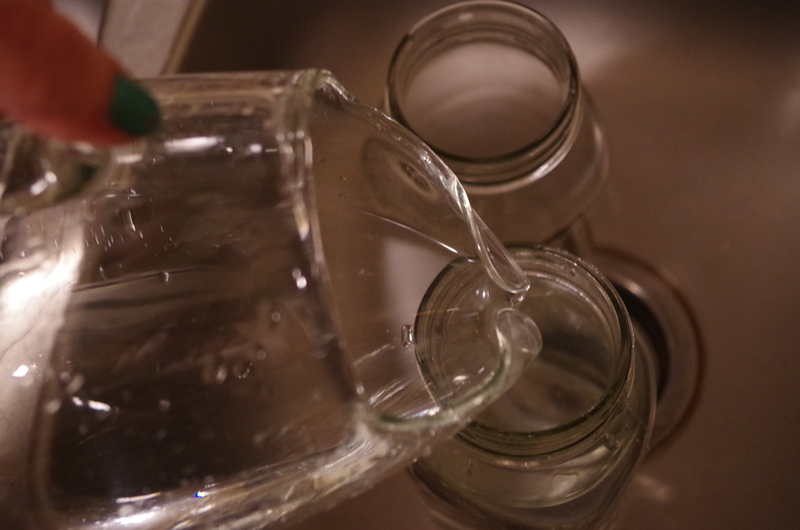 Now, pour the water from this fine glass pitcher into the Mason jars. 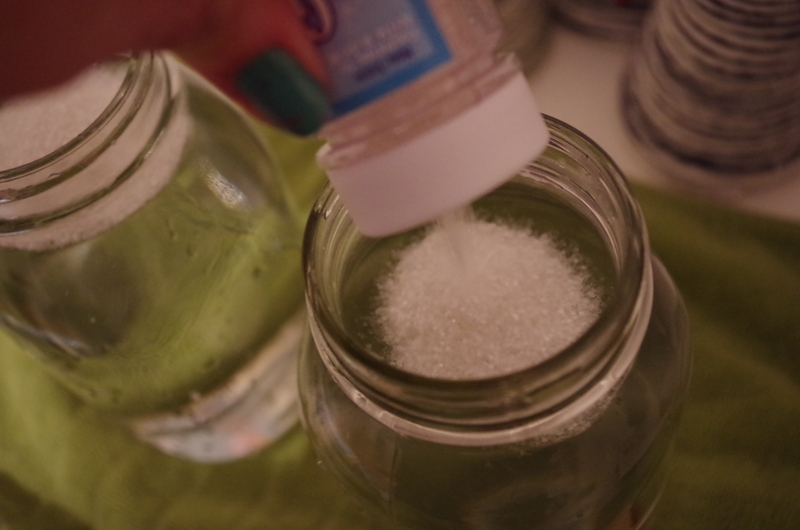 It’s probably a good idea to make sure you have enough water to fill the Mason jars, too. Add a dash of glycerin to the water, even though you have no idea what a “dash” is and you don’t really know what glycerin’s actually supposed to do here, except that other actual craft bloggers said stuff about how it makes the snow not fall as fast and you guess that’s about right, plus who are you to argue with actual craft bloggers? 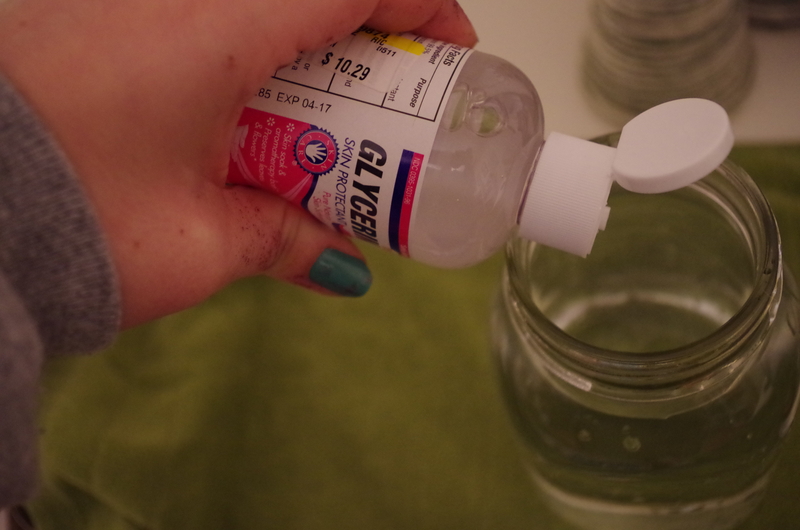 Also, while you’re adding the glycerin, you’ll freak out thinking that your fingers are bleeding. Your fingers are not bleeding, they’re just covered in pink Glitterblast spray paint. Don’t panic. ADD GLITTER. The craft blogs will say you can add as much glitter as you want, and you want A LOT OF GLITTER. 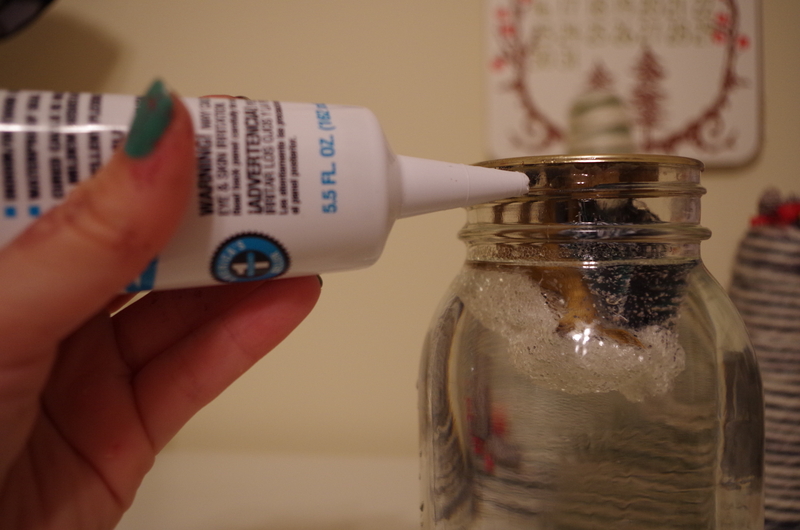 Put some superglue around the edges of the Mason jar. If you spill some, you might think it’s a good idea to touch it with your bare fingers. It isn’t. Put the lid upside down on top of the Mason jar. This will probably be about the time you remember that you bought some sealant from Lowe’s like a year ago because your duplex is, let’s be honest, a little tragic and the sink didn’t want to stay in the hole where the sink was supposed to stay. You’ll think to yourself, well, better not let all that sealant go to waste, but you’ll also panic before you use it and Google eleventy combinations of sealant + superglue to make sure you’re not going to make your duplex explode because even though it is slightly tragic, it’s still full of you and your pets and things. 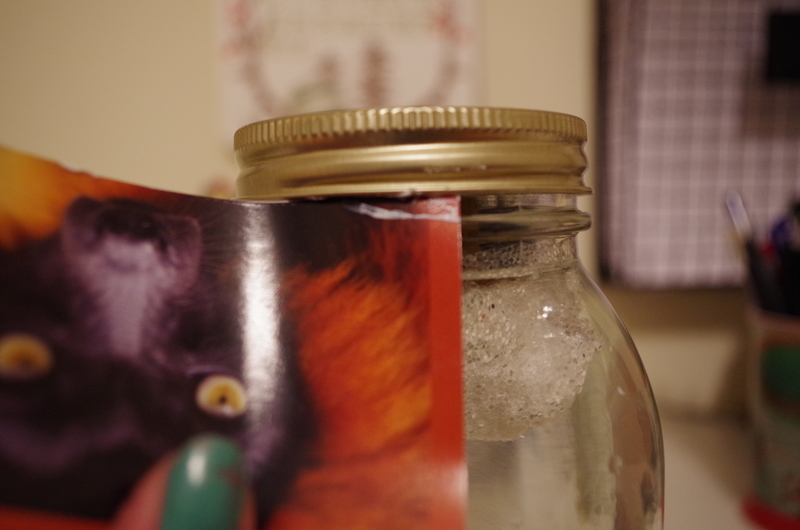 Screw on the Mason jar’s outer lid and wipe away any excess sealant with a picture of a monkey you have laying around because you forgot to bring in paper towels and you are the kind of person who has a picture of a monkey just laying around. You will want to turn the snow globe over immediately to experience the hand-held wonder of winter. DO NOT TURN THE SNOW GLOBE OVER IMMEDIATELY. Actually, it might be okay if you do this, but you’re kind of obsessive when it comes to crafting and you want this craft to be right, so you decide to wait until it dries overnight. Again. And there you have it! 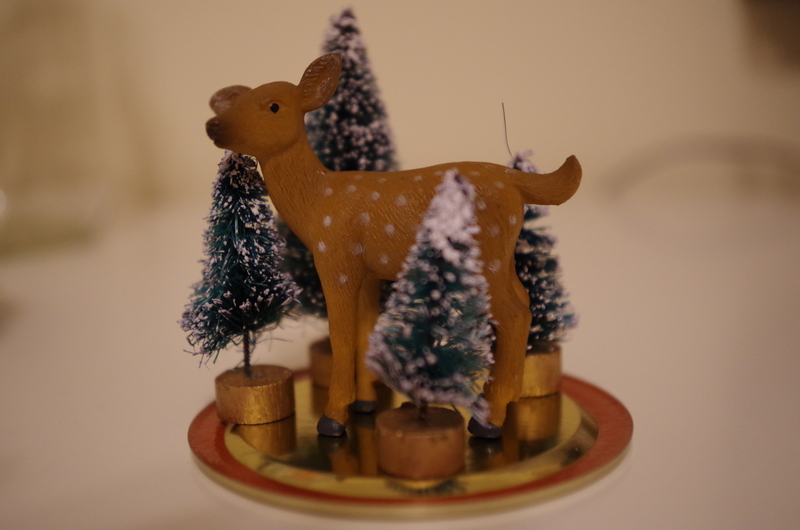 A tiny deer frolicking amongst a tiny copse of tiny bottle-brush trees in your own hand-held winter effing WONDERLAND! Now you can display your snow globe with all of your other festive holiday crafts on a little table in your hallway where you keep all of your favorite books, because really, what says merry Christmas and happy holidays more than a collection of books by poets who died tragically and/or committed suicide? I’ll tell you what: NOTHING. I HATE Christmas but I LOVE glitters!! I will promptly be making a snow globe with the image of my arch nemesis (Helena Bonham Carter) trapped in a happy fairy wonderland! I found your post whilst researching snow globe creation, and I like your rendition, but I LOVE your prose and your attitude! Thanks for writing. I know,everyone’s a writer these days, and it’s so annoying, really, but your writing is wonderful, i.e., good good good. I look forward to more. Tally ho.